Today was trends day. The first three sessions I attended were about trends in Mobile and the other two (user generated content and ten mobile start-ups to watch) are also trendy. The day started off with a general session. The sessions of today contained a lot of information. I make my notes as a mind map so I decided to share them with you and add some comments to them. I you have any trouble reading them, just click on the to enlarge. Three perspectives on making mobile e-Learning work. The morning keynote with three presenters: Geoff Stadd, Clarck Quin and David Metcalf. I made my notes in a mind map and decided to share that with you and just comment on it. I can see some red lines in these three presentations. Mobile learning is here to stay and is developing rapidly, at least the technology and platforms are. MLearning is not a replacement of e-learning. It is not about courses, but it is about specific types of learning and support: user support, job/task aid, communication and collaboration. MLearning is part of your total learning solution with specific strengths and weaknesses. You have to take into account that these guys are talking about trends that are possible. A lot of the technology they are talking about is on its way or is brand new (like TinCan). It will take a while before they will find their way to the general public. More important for now is the message that you need to design new forms of e-Learning that will suit the mobile devices and that add value to your learning solution. There is also a distinction between smartphones and Tablet. Due to their screen size smartphones are less suited for courses, tablets are more suited. A panel discussion. They had prepared five topics from a developers perspective and five from a users perspective. Again two mind maps. The panel didn’t agree on social learning in a corporate environment. One stated that it was a disappointment; the other said that it was all over the place. I think that corporations failed to facilitate social learning and that they can’t measure it, so for them it isn’t there. Social learning is part of informal learning, you can’t control that. Although the corporations see it as a failure the learners will find each other through (open or closed) social networks. Again the message was that you shouldn’t port your e-Learning courses to mobile (phones) but that you have to find new forms of (mobile) learning and facilities. And there was a whole discussion on social. It was more about the fact that we expect these services for free, which causes a problem in the revenue model of these services. The panel was divided. Some expect those services (like twitter) to charge money in the future. Others didn’t, they believe that these services create value in an other way and that they can survive without charging money to end users. As you can see they only covered one of these topics; Video. They all agreed that video will be more and more important and that is is very valuable for instructions (how to). Since we have YouTube you don’t have to hire expensive actors or do a lot of editing. A video made with your mobile will do. There was a discussion on how to search on video’s. Right now you can only search on terms that videos are tagged with, they expect that new smarter forms of searching (like face recognitions, or pattern based searches) will be available over the next few years. 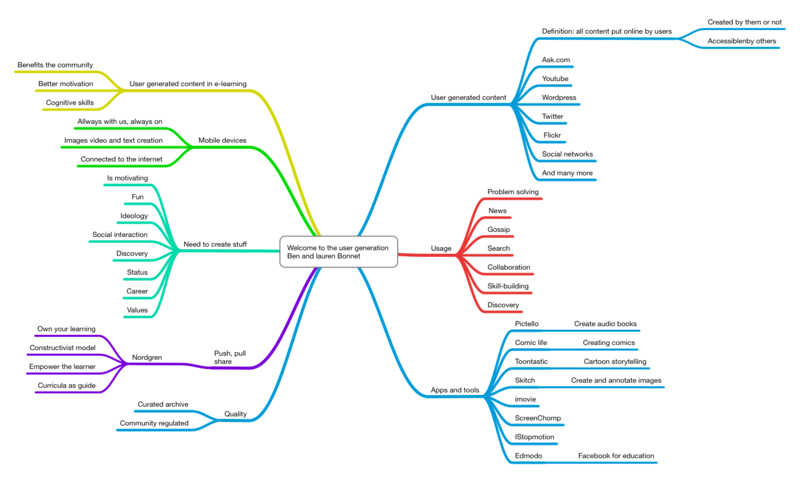 Trends in mobile Learning. Harvey Sing. His trends are: HTML5 content and apps will be dominant. The LMS and content will be more and more in the form of apps. He foresees a future for mobile authoring of e-learning content. Simpler API’s (like TinCan) will come available and he expects platforms that will generate apps for us, so we can focus on the content and not on the technique. His presentation is available in MapDeck , search for Singh. A presentation from Ben and Lauren Bonnet. He works as a consultant she works at a K12 school. They are passionate about user generated content and they are convinced that mobile devices are ideal for creating it. The first part of the presentation was about why they believe this. After that Lauren showed a number of apps they use at her school. Nice apps, but for most of them I don’t see an application in a corporate environment. Ben closed the session by telling how they (in his company) use the user generated content. Two new ones for me. I never heard of ‘flipping the classroom’ before. Its means that students make their homework in the class en study at home (supported by mobile devices and apps). He claims that it is a productivity booster. Interesting concept. The other new item for me was the ‘Rockstar teacher’. He believes that the best teachers in their field will through the web teach millions. Student ratings will decide who is the best. He is convinced that this model will replace ‘Colleges’ as we know it. There are some very interesting ones among them. Not all off them are learning initiatives, but the concept can be applied to learning. One thing that can influence our learning community on a short term is Apples Ibooks author. He believe that this will be another game changer. That was it for today. I hope I didn’t bore you with this very long post and I hope that the mind maps work for you. Tomorrow the last half day of the conference and than back home.